Seems there’s a rumble between Pantone Color Institute who has designated Living Coral as their 2019 Color of the Year and Sherman Williams who has chosen Cavern Clay. Benjamin Moore also chose a gray color they describe as “stylish and understated.” While I’m not pushing any paint company over another I do have to say that I’ll be incorporating more coral and other warm colors in gardens I design this year. Gray and silver foliage complement bright colors so I’m not really ignoring them. A while back when all things were growing under warm sunshine I came across a garden filled with coral, apricot, papaya and orange toned flowers along with various shades of blue and violet. We all dream of a garden consisting of just 2 or 3 colors and this palette of strong colors pulled it off beautifully. Don’t be afraid to play with color even if you don’t get it right the first time. Just learn from your mistakes and make adjustments. Whether it’s a pastel Monet garden or a hot Samba garden you want to create, here’s how your own garden can draw oohs and aahs in every season. Warm colors tend to be more stimulating, dynamic and noticeable from afar than cool hues which are more calming and understated. Warm colors advance visually, cool ones recede. So to make a small garden appear larger use cool blues and lavenders in the back with just a touch of scarlet, orange or yellow up close for contrast. Do the opposite to make a large space more intimate – position warm colors at the back, cool colors in front. Garden colors aren’t static either. They vary with time of day, the season, the weather and the distance from which we view them. Also color perception varies among people and not all people with normal vision see color the same way. Since color and light are inseparable, white, yellow and pastels seem more vivid in low light. In overcast or fog, soft colors like pink, creamy yellow, pale blue and lavender come alive. As night approaches and the earth is bathed in blues and violets, those colors are the first to fade from view. Have fun with color. Try new combinations. I often hear people say “I like all the colors except orange”. Orange naturally combines with blue as these ‘sunset’ colors are opposite each other on the color wheel. Think how nice bright orange California poppies look with blue marguerites or peach poppies with blue violas. You might not think of linking orange with pink but it’s a pleasing combination. It works because pink is analogous with purple. Try combining orange calibrachoa in a planter with pink arctotis and lavender Silver Sky bacopa to harmonize with the pink and contrast with the orange. Foliage is a rich source or garden color. You can find plants with yellow, red, purple, blue or gray foliage as well as shades of green with variegated, marbled or streaked leaves. Rose Glow barberry has rich marbled bronzy red and pinkish hew foliage and looks sensational next to coral Grosser Sorten pelargoniums. And don’t forget white, cream and silver flowers and foliage to brighten up the night garden. White combines nicely with both warm and cool colors so it’s easy to place. It’s an effective peacemaker between colors that would clash if placed side by side. In shady gardens, plants like white bleeding heart, wavy cream-edged hosta, white browallia, white hydrangea, lamium and white calla lily pop at night. Gardens in more sun can plant Holly’s White penstemon, silvery bush morning glory, dichondra Silver Falls, fragrant Iceberg roses, white sweet alyssum and Whirling Butterflies gaura for the butterflies. Plants grow and gardens change over time. Realize that you’re embarking on a journey that may take many years. Have fun getting there. As the days grow longer I anxiously await those warm summer nights when I can sit outside and enjoy the evening air. As daylight fades it’s the white or silver plants and flowers that come to life. Whether your view is from a window or from your favorite place on the patio be sure you have a “white garden” to light up the garden late into the evening. Sometimes the best color for your garden is white. Even on a grey day a white garden looks fresh and inviting. With so many white flowering plants, those with white variegated foliage and silver leaved plants to choose from yours can beckon you throughout the seasons. White feels relaxed and clean and will slow you down after a long day. The plants that take a starring role springtime in a white garden include some of my favorites. I just need to get them all in the same area of my garden in order for them to do their magic. striped variegated foliage. 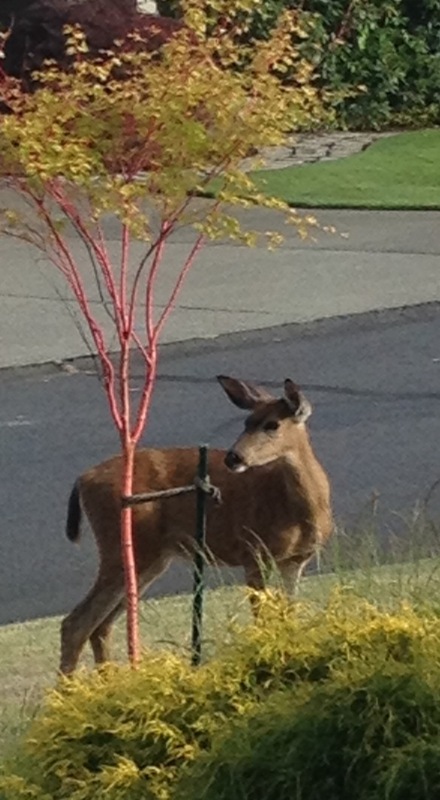 Easy to grow and deer resistant they won’t break your water budget either. The bearded flowers are a spectacular shade of lavender blue and this variety of iris is more shade tolerant than most. If I add a few more white flowering plants to another area I can have two moon gardens. I wish I had room for a sturdy trellis as I’d surely plant an evergreen clematis. Their scent alone would justify the space. Another candidate for a strong support would be a white blooming wisteria like Longissima Alba. Guess I could get a wisteria that’s been trained as a standard or tree. As it stands I’m keeping a star jasmine pruned to a shrub so I’ll have that sweet fragrance starting in late spring. For my shady garden one of the flowering plants that glows in the fading light of the day or the light of a full moon is pieris japonica or Lily of the Valley shrub. The huge clusters of tiny bell-like flowers are spectacular. Along with the huge variegated foliage of ligularia ‘Argentina’ or Leopard Plant both are sure to draw my eye at the end of a long day. Choisya or Mexican Orange is one of those work horse shrubs that grows fast, has few pests, is deer resistant and the fragrant lowers will scent your garden in the spring and sporadically throughout the whole year. The handsome foliage looks clean and vibrant even in the winter time. In addition to my white flowering dogwood I have long planned to add California native, Western Azalea to my garden. A true native of California it’s found only in our state except for a tiny spot where it extends into southern Oregon. In addition to the Sierra Nevada it grows naturally in our area and then up the coast north of San Francisco. The large floral trusses are breathtaking- sparkling white marked with a bright yellow spot. The fragrance of the flowers is sweet and spicy clove reminiscent of cottage pinks and carnations. Their beauty and fragrance will enhance any garden. Other native plants with white flowers are Philadelphus lewisii or Wild Mock Orange. Also Carpenteria californica or Bush Anemone is a beautiful plant to include in a white garden as is silver lupine and douglas iris ‘Canyon Snow’ -often described as being one of the most reliable native iris. Later in the season look to white hydrangeas– mophead, lace cap or oakleaf- to add to your moon garden. Sally Holmes roses, hardy geranium ‘Biokovo’, Even the common Santa Barbara daisy when planted en masse makes quite a statement in the white garden. What do you get when you combine a world renowned pottery artist with a reformed corn grower? On California Street in Ben Lomond, the result is the Brook Lomond Iris Farm of Rick and Chris Moran. This fun, educational, inspiring couple recently invited me to admire this year’s crop of tall bearded iris grown with certified organic gardening practices as well as to share their organic vegetable garden, cactus and succulent collection and Chris’ unique pottery. They are getting ready for this year’s annual iris sale coming up April 30th as well as May 1st and 7th from 9:00-4:00 each day when the iris blooms will be at their peak. 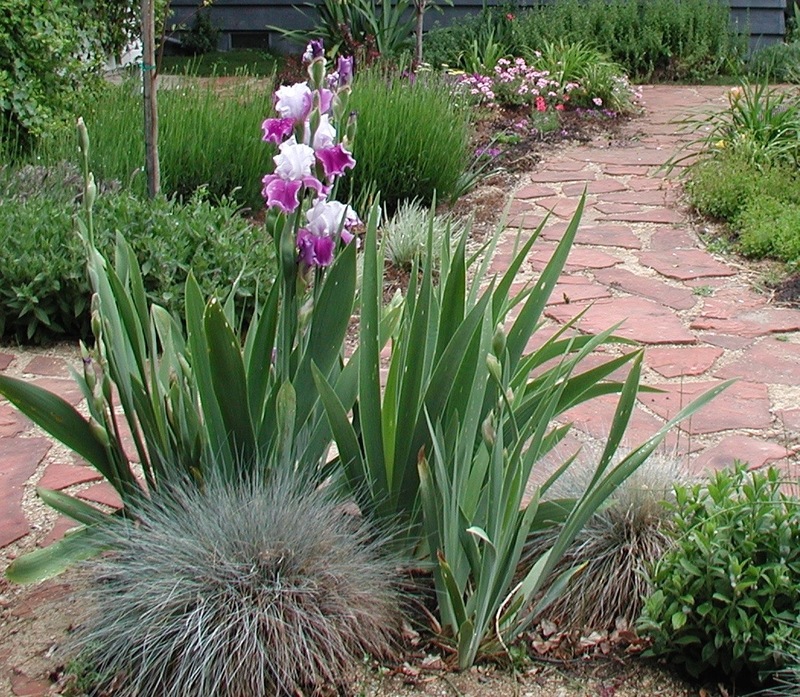 Upon arriving my eyes were torn between the colorful beds of iris on my left and the blooming cactus and succulent collection displayed on the flagstone entry garden on the right. I later learned Chris cut and laid the flagstone herself. Inside the house Chris’s fabulous coiled pottery vases, urns and jugs in their great room were so amazing I had a hard time tearing myself away to start the tour of the back garden and iris beds in the front. Cody, their new dog, was good company as I learned how the Moran’s came to start an iris farm. When Rick Moran was 13 years old he worked at LoPresti tomato farm in Connecticut. “I hated it,” he laughs. Later when he was a student at UCSC he used to pass by the Chadwick garden and says he “got the gardening bug by osmosis”. After graduation the couple moved to Bar Harbor Maine where they started a community garden. Chris displayed the cactus and succulents she had moved there in a heated porch which was quite the talk of the town for neighbors passing by on a snowy day. When they moved back to this area and found the sunny lot in Ben Lomond, Rick added nine yards of chicken manure mixed with rice hulls and planted corn. He had visions of savoring succulent ears of corn for dinner but quickly realized that the amount of water needed to grow corn was prohibitive. That was after the Chris’ succulent failure. He and Chris wanted to come up with a crop they could make a little supplemental income. She used to sell her cactus and succulents when they lived in Capitola at the drive-in in Santa Cruz many years before but after planting fancy succulents in the front yard and seeing them turn to mush in a Ben Lomond freeze they realized succulents weren’t going to work either. The iris are starting their blooming cycle now. Some bloom earlier than others. By planting early, mid and late blooming varieties you can extend their colorful show for several months. Iris also make a good cut flower and many are fragrant. Chris told me that you can tell when an iris was hybridized from it’s shape. The early types are not as frilly as modern varieties. She pointed out a bed of Wabash Heritage which was first introduced in the 1920’s- simple with three falls. The lovely sky blue flowers of Striped Zebra iris smelled of Grape Koolaid. Chris explained that the flower scent develops as they sit in the sun. The aroma is not as strong when they first open. The Brook Lomond Iris Farm is located at 10310 California Drive off Highway 9 in Ben Lomond. Just look for the tall flags waving in the breeze and bring your camera. Iris rhizomes for sale are chosen for hardiness in this area and the Morans are always on the lookout and adding the newest varieties available such as the deep purple Dusky Challenger. The Iris Farm is educational as well as beautiful- a place the whole family will enjoy. Outside my window a Townsend warbler feasts on suet. It’s a rainy day and my obsession with low water use plants is momentarily taking a break. Each day the soft colors of my fall garden are becoming brighter and more vivid. Backlit leaves take on a whole new look. There are so many ways of combining plants in the garden. I’m taking notes so I remember my favorites to include in my own garden and future designs. Fall is a good time for planting or planning. Many of my grasses and plants are deciduous and are in the process of going dormant. Even when I mix in broadleaf evergreen plants these groupings lose their impact this time of year. I have only been gardening at this house for a little over a year so the new plants are still young. I’ve had to replant many shrubs and perennials as I was a little cavalier with my gopher basket use. But I persevere as I love color in the garden, especially foliage color. It’s the combinations that look great year-round that hold a garden together. I’ve got two leucadendron that are real troupers when it comes to drought, mucho summer sun, zero winter sun, sandy soil and deer browsing. The ’Safari Sunset’ shows off those vivid burgundy bracts nearly year round with the best show starting during the summer and extending through the next spring. Leucadendron require good drainage and prefer acidic conditions. It’s easy to love this plant to death with too much water. I mulch mine heavily with bark chips. I’m thinking of adding the South African, long-blooming bulbine ‘Hallmark Orange’ at its feet. The combination of the two guarantee color year round. Blue and yellow are another combination that always look good together. You can pick from yellow and gold foliage plants such as phormium ‘Yellow Wave’, abelia “Kaleidoscope’, coleonema ‘Sunset Gold’ or sedum ‘GoldMoss’ and pair it with a dwarf blue spruce, blue fescue or blue oat grass, hens and chickens, a blue euphorbia such as ’Glacier Blue’ or ‘Blue Haze’ or the blue-gray succulent senecio mandraliscae. 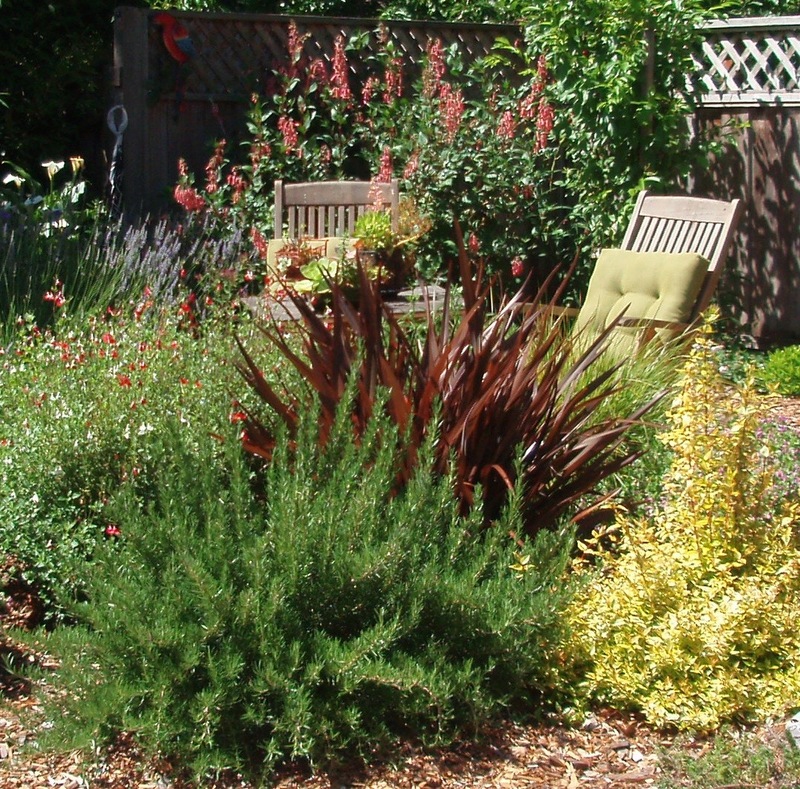 In these days of converting lawns to low water use landscapes, choosing the right plants is even more important. Use to be a row of foundation shrubs between the lawn and the front windows were the norm. This was not a very inspiring look at best. Think of the possibilities to create a whole new look for your front or back yard. I like all the colors so it’s hard to whittle down a plant palette to just a few for the whole garden. Breaking up your areas into different “garden” rooms allows you to pair colors like silver, purple and black in one section using a bronze phormium, a burgundy loropetalum and silver thyme. In another section of the garden that can be seen from a window might you might want to attract hummingbirds. Blooming late in the season the super tough Pineapple sage with eye-popping red flowers combines well with the dark green of an upright rosemary and an Amazing Red phormium for an architectural dramatic touch. In a garden that inspires you the plants should be ones that you love looking at and taking care of. Some of us like the look of dark green plants while others like grasses that move in the wind. Others are not fans of succulents. Whether you grow plants to feed the birds and attract wildlife or want a little bit of everything there’s a combination of plants that’s perfect for you and your garden. We all enjoy privacy around our homes. Even if you’re best friends with your neighbor you don’t always want to wave at them each morning in your robe. Whether you have a property tucked way back in the forest with a next door neighbor that looks right down on your deck or a postage stamp size lot that could be an jewel if you just had a screen between you and the next property, there are techniques designers use to make your home a private oasis. Narrow spaces can be challenging when you need to screen the house next door. There’s not room for a big, evergreen tree or hedge to solve the problem. 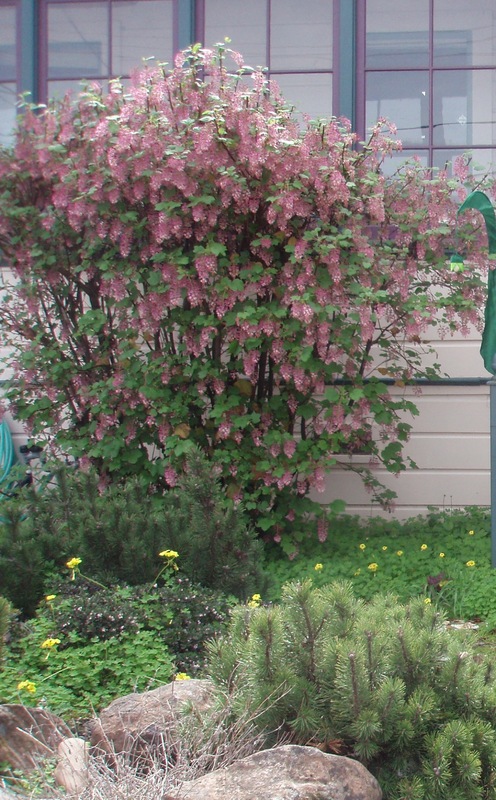 One way is to use plants that can be espaliered against a fence or trellis. 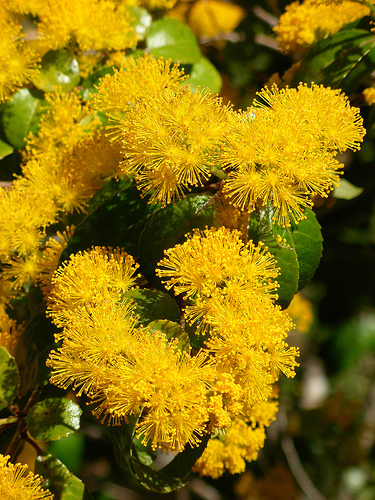 Some plants like azara microphylla naturally grow flat without much coaxing on your part. This small dainty tree is fast growing and reaches 15-25 ft tall. The yellow flower clusters will fill your garden with the scent of white chocolate in late winter. They are ideal between structures. I’ve used the variegated version to screen a shower and it’s working great. 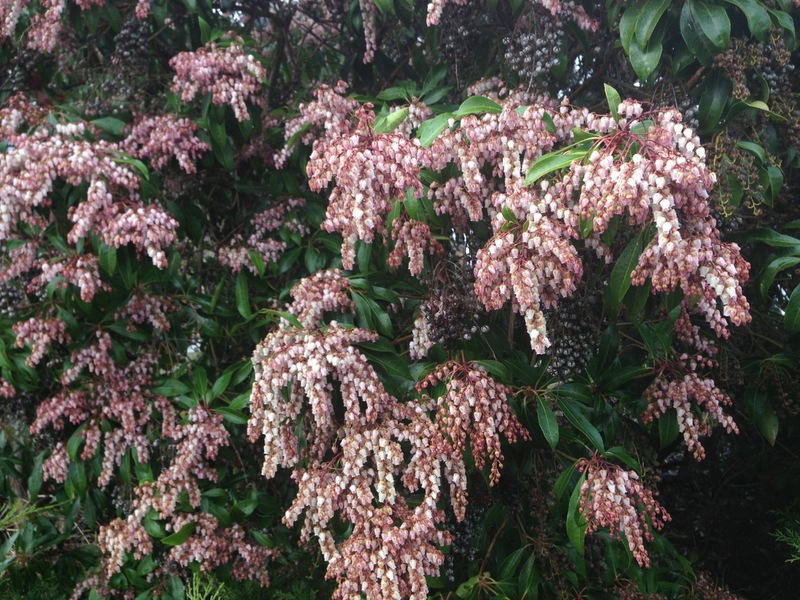 Another small tree, the Compact Carolina cherry laurel can be espaliered also in a narrow space if needed. It grows 10 ft tall but that may be all you need to screen the neighbor. They are drought tolerant once established, deer resistant and the perfect host for birds, bees and butterflies. The leaves smell like cherries when crushed which gives this plant it’s common name. A dwarf tree that also works nicely in this situation is a Southern magnolia called Little Gem. Naturally a very compact narrow tree it grows to 20-30 ft tall but only 10-15 ft wide. It can be trained as an espalier against a wall or fence and the sweetly scented flowers will fill your garden with fragrance. Other small trees that make a good screen are purple hopseed, and leptospermum ‘Dark Shadows’. Both have beautiful burgundy foliage. California natives that can be espaliered against a fence include Santa Cruz Island ironwood, Western redbud, mountain mahogany, toyon, pink flowering currant, Oregon grape and spicebush. If you have a wider space to grow screening plants, one of my favorites is Pacific wax myrtle. 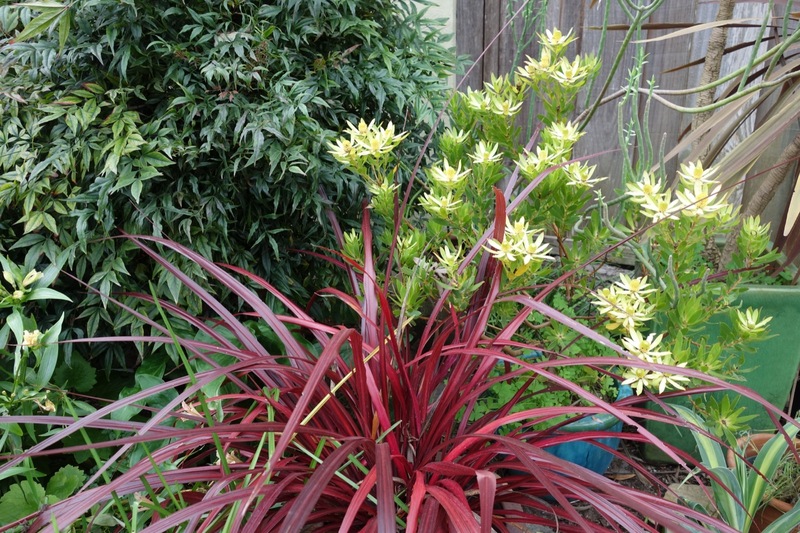 This California native grows quickly to 30 ft tall with glossy, rich forest green leaves. Its dense branches make a nice visual and noise screen for just about anything or anybody. I’ve never used the subtle spicy leaves for flavoring sauces but I might try it next time a recipe calls for bay leaves. Best of all the fragrant waxy purplish brown fruits attract many kinds of birds. Italian buckthorn is another evergreen screening shrub to consider. It reaches about 15 feet tall by 6-8 ft wide and has low water needs. It can grow 2-3 feet in its first few years making a quick screen. 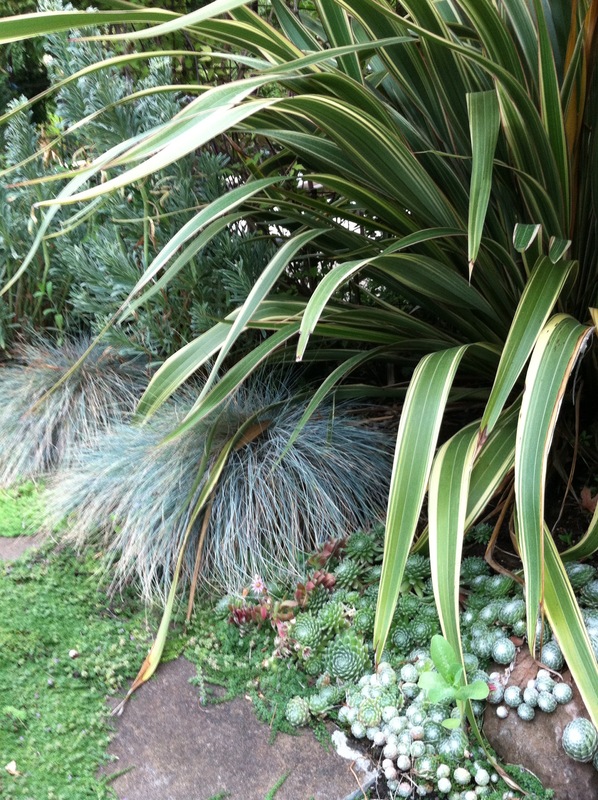 There’s a variegated version with stunning foliage that looks awesome mixed with the green variety in a hedge. Another favorite hedge plant, the California coffeeberry grows 6-8 feet tall and gets by with very little summer water once established. Birds love the berries. I also like osmanthus fragrans for a screen with a sweet scent and pittosporum ‘Marjorie Channon’ or ‘Silver Sheen’ with their showy variegated foliage. If it’s just not practical to screen the perimeter of your property redirect your line of sight to keep attention focused on the garden instead of on the landscape beyond. A recirculating fountain as simple as an urn spilling onto cobbles at the base can disguise noise and become the focal point. There are lots of ways to add privacy to your home. A year or so ago I planted a special kind of Japanese maple in my sister’s landscape. I traveled up to her house recently to celebrate our birthdays which are only 2 days apart and to check on the maple’s progress. Prized for their their brilliant salmon red bark which is much brighter than the regular coral bark maple, my sister’s Beni Kawa Japanese maple is coming along fine. I forgot to buff the bark with a soft cloth to polish it which keeps the color bright but I’ll be sure to remember that next summer when I visit again. I also wanted to check in on her neighbor’s organic garden that I wrote about last summer. Bob was happy to show me what’s in the works for this year. Although he was fighting a cold -you can’t keep a good gardener down- he shared a few tips he is trying out this year. Raw sawdust is his magic weapon in the strawberry patch. Sprinkled between the strawberry plants it is said to prevent annual weeds from germinating. He’ll get back to me with the results later in the season. His grapes were nicely pruned, the raspberries just starting to bud and the garlic which he planted last fall was about a foot high. The raised veggie boxes have been planted with lots of peas. Inside the green house, several types of kale and lettuce were just emerging in their flats. Bob told me that this year again everything seems to be about 3 weeks early- sound familiar? As I walked the neighborhood enjoying the various blooming plants and taking in the sights of majestic Mt Rainier and the Puget Sound I admired many plants that also thrive here in our neck of the woods. A plant that grows in a multiple of growing conditions is always a winner in my garden. Here are a few notables from Fox Island. What could a plant that is iconic of Scotland have in common with our area? Easy to grow heather and true heath look great in the garden at any time of year. Although both belong to the Ericacaea family, they are botanically different and are divided into the Calluna genus and the Erica genus. In the garden, however, they are nearly identical in color, shape and growing habits. I love their colorful foliage and flowers and have seen the true heath, Erica canaliculata ‘Rosea’ blooming now also in gardens in our area. It is tolerant of winter lows a bit less than 25 degrees and will thrive in soil that is more alkaline than the calluna vulgaris heathers. 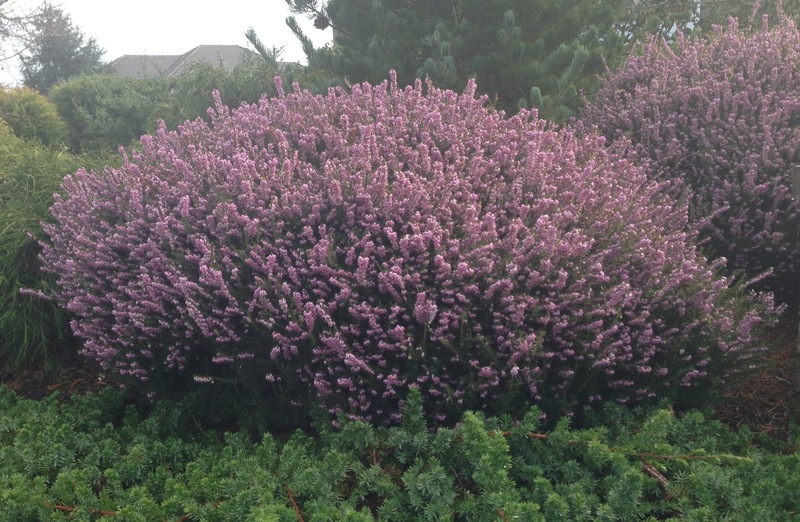 Calluna types need more organic matter in the soil to really do well. Our acidic mixed redwood soils provide this and calluna cultivars are very cold tolerant. All need good drainage. Another shrub that I admire where ever I find it is Valley Rose’ Lily-of-the-Valley. The other vivid rose variety which grows a bit taller is Valley Valentine. It seemed most gardens on Fox Island had at least one of these beautiful plants in full bloom including the stunning white flowering forms. Books might tell you they require average water but established specimens are remarkable tolerant of drought. Although it wasn’t blooming yet I came across a lovely choisya Sundance also called Mexican Orange Blossom shrub which describes the fragrant orange blossom-like blooms. 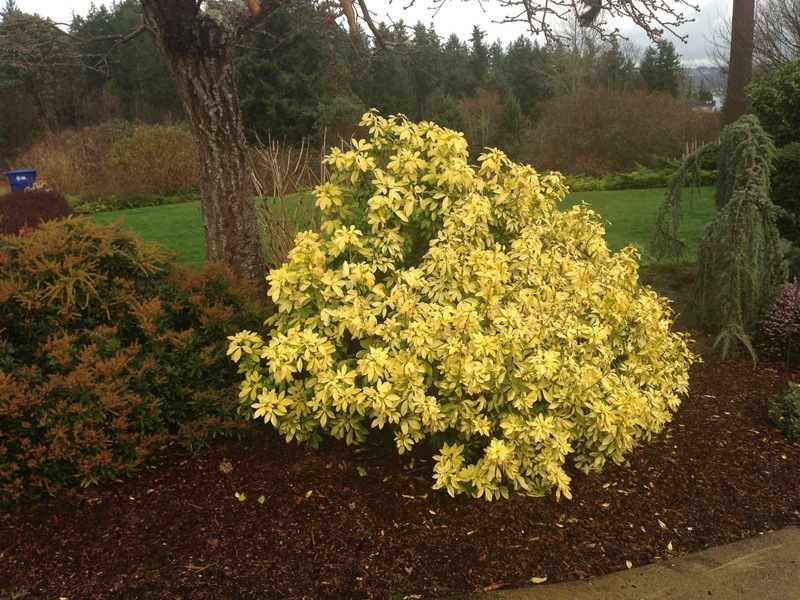 The new growth of this fast growing, evergreen, deer resistant shrub is colored bright chartreuse and provides year round color to the garden. 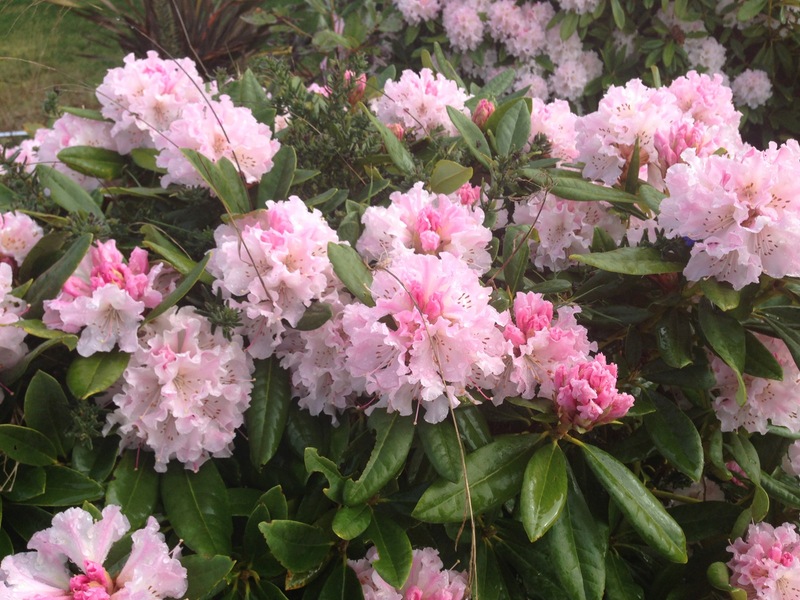 To round out my tour of local landscapes on Fox Island many of the early rhododendrons were starting to bloom. Covered with vivid pink flower trusses they looked great planted with viburnum davidii, daffodil and narcissus, iberis and black mondo grass. All grow great in our area too. We have a lot in common despite the distance between us.